Just ten miles from the ski area is a 6 bedroom home with lovely upgrades by the new owners. 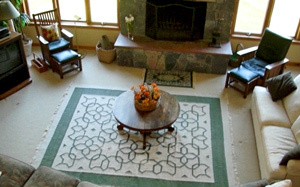 The entranceway has a 16 foot by 30 foot, 3-season room with lovely Adirondack Furniture. There are ski racks and rubber trays for skies boots and winter clothes. In the summer this area is great to relax, let a cool breeze pass through, but have the ability to close the windows if the evening becomes chilly. Two garages for keeping your cars warm. 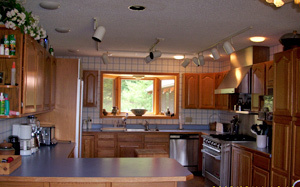 The large kitchen, with an eat-in area, is one of the largest kitchens in the area with a commercial stove, a giant refrigerator with panel doors added to the matched kitchen cabinets. A formal dinning room is just off the kitchen. The Adirondack log/stick furniture is very comfortable in the dining room and the side pieces in the living room help the visitor gage what they can do with a change in their furniture to an Adirondack Cabin look. The stereo system and the two TVs with two DVDs allow everyone to watch their favorite evening programs after skiing. 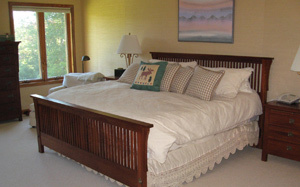 On the main level are 3 bedrooms with a king in the master bedroom and 2 queen sized beds in the other bedrooms. 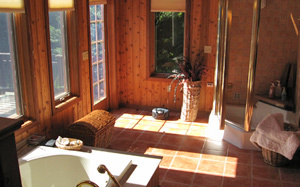 There is a bathroom in the master suite with a 2 person hot tub and a sauna shower. There is a bathroom and a half separating the 2 bedrooms on this level. Upstairs are 2 twin bedrooms and the lower level has 2 more bedrooms and a full bath. The property features a large back yard with an in ground heated swimming pool. There is a large swing set with slide, swings and baby seat for non-winter use. For summer use there is central air conditioning to make a vacation comfortable. 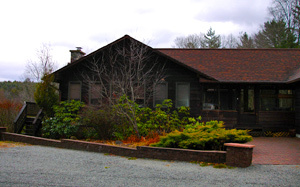 This would be a great place to kick off from to ski, attend the Americade, Parent's Camp Weekend, Adirondack Marathon, Oktoberfest weekend, Hot Air Balloon Festival, or take your boast to one of 4 lakes just minutes away. The new wood floor in the basement has been a joy for those using the 14 station work out room. 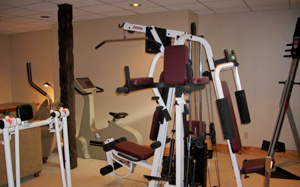 There is a TV with DVD, so be sure to bring your favorite workout video. The laundry room is 8 by 16 feet long.